Scanning Probe Microscopy in Industrial Applications emphasizes nanomechanical characterization using scanning probe microscopy. 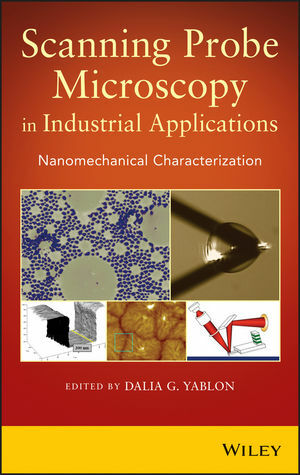 The first half of the book is dedicated to a general overview of nanomechanical characterization methods, offering a complete practical tutorial for readers who are new to the topic. Several chapters include worked examples of useful calculations such as using Hertz mechanics with and without adhesion to model a contact, step-by-step instructions for simulations to guide cantilever selection for an experiment, and data analysis procedures for dynamic contact experiments. Contributions are based on the authors' thorough review of the current literature as well as their own firsthand experience applying scanning probe microscopy to solve industrial R&D problems. By explaining the fundamentals before advancing to applications, Scanning Probe Microscopy in Industrial Applications offers a complete treatise that is accessible to both novices and professionals. All readers will discover how to apply scanning probe microscopy to build and enhance their R&D efforts. DALIA G. YABLON, PhD, developed and led a state-of-the-art scanning probe microscopy facility for more than ten years in Corporate Strategic Research, the flagship R&D center of ExxonMobil Corporation. Under her direction, scanning probe microscopy was used to characterize, conduct failure analysis, and probe structure-property relationships across all sectors of the vast petroleum business including areas of polymers, tribology, corrosion, geochemistry, and metallurgy. She currently leads SurfaceChar, a characterization consulting company.